Évitez le trafic du samedi avec un rare pour trouver le jour du roulement du vendredi. Si vous préférez les vacances traditionnelles du samedi au samedi, nous pouvons nous adapter à cela aussi. Cet établissement entièrement rénové dispose de 2 salles de bain complètes avec 3 chambres. Lorsque vous entrez dans la maison Planchers de bois franc en bambou vous accueillent, un plan d'étage ouvert offre un espace de vie spacieux avec Smart TV, salle à manger et cuisine ouverte avec comptoirs en granit et appareils en acier inoxydable avec un petit bar. Le pont avant est fermé pour garder les petits en toute sécurité sur les lieux et la cour arrière est également entièrement clôturée, offrant une intimité pour profiter de la cour, et un must de la mer - une douche extérieure. La suite principale du rez-de-chaussée dispose d'un lit Queen Size et offre une petite salle de bains et une télévision avec un lecteur Blue Ray DVR intelligent pour vous permettre d'accéder à tous les abonnements que vous pouvez avoir comme Netflix ou Hulu. Les 2 autres chambres offrent un lit double et (2) des jumeaux avec une salle de bain complète partagée dans le couloir. La maison est située à distance de marche de la plage Diamond et Sunset Lake. We stayed for a long weekend.The home is just as is pictured online.Amanda was very helpful.We would definitely stay again on our next trip. Will definitely stay again next year. Glad to hear you would like to stay again, we love when great people chose to cone back. Your always welcome. Recently stayed here with my husband, inlaws and 17 year old & friend during the 4th of July week. 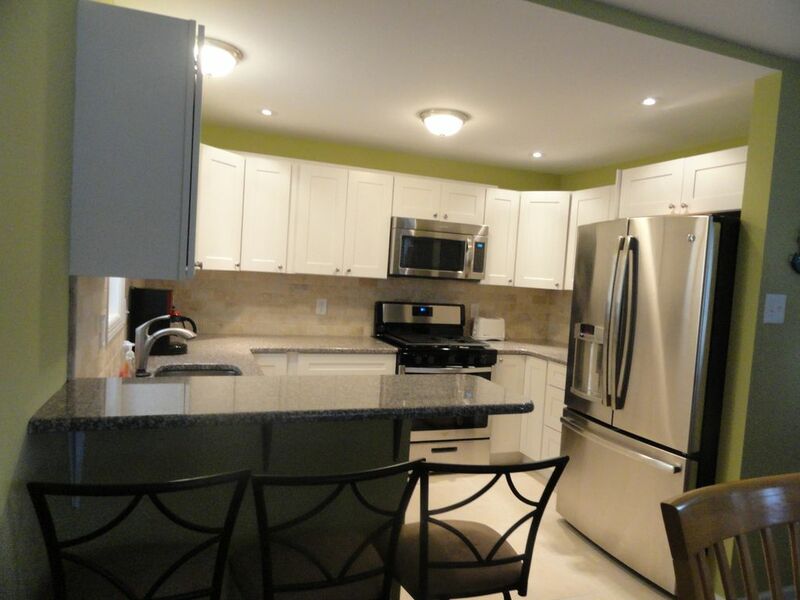 The house was super clean, updated, comfortable & well equipped. Very quiet neighborhood but yet close to restaurants and deli. Loved using the outdoor shower! Thanks for having us, we would definitely stay again. Amanda is very quick to reply and helpful with booking, etc. We had never used VRBO before and in that respect she really helped things go smoothly! We had a last minute schedule change and Amanda was extremely kind and understanding and willing to work with us. The house is in a great location and on a quiet street! We felt safe and were very pleased with the location! The house is updated. We appreciated the nice refrigerator and dishwasher! The outdoor shower was also a nice addition. Overall the home looked clean upon arrival but after opening window blinds we found many dead flies and the bathroom floors had a lot of hair. Minor, but we did feel that we needed to clean the bathrooms before using. We struggled to find measuring cups, measuring spoons, a working can opener, and other basic items. If you don't plan to cook, it wouldn't be a problem at all. Lastly, when we arrived there was an ant trap at the door and 2 on the kitchen counters. We set our leftovers on the counters as we brought them in from the car. A few minutes later when we came back close to 100 ants were all over our food. We called Amanda right away and she graciously offered to refund our money and we leave, but, in the middle of summer where were we going to find a place to stay at a moments notice? She also offered to have a company come and chemically treat the ants. But as Amanda stated, she would not even personally feel comfortable with the chemical application with two young children and nor did we. We were unable to use the kitchen much at all and had to keep all food on the kitchen table away from the ants as best we could. It was a very difficult week battling the ants. At the end of the week we asked Amanda for some small compensation for the difficulty and she would not respond. We were disappointed about this because otherwise, we would have likely returned yearly!! I did respond to your request for a refund - the request was denied. I offered you a full refund upon arrival and complaint of ants which you rejected. I offered TWICE to get the Pest Control company in and you emphatically rejected. The chemicals that I said I would not subject young children too is the RAID. I personally have my primary residence treated for ants regularly and I have no problem with any chemicals, most of the treatment is outside the home and in cracks and crevices that you do not have contact with. I specifically asked you when you complained that there were ants in the home if the home was clean and you told me it was spotless. Had there been an issue with cleanliness the cleaning service would have been called back in immediately to resolve the problem. You did not mention any cleanliness issue until after you left the home. The Pest Control Service was in the home within an hour of your departure - they told me that the ants were really not that bad, he said he only saw a couple. He treated the entire home. We really enjoyed our stay here. The house was very nice, well furnished and with a great kitchen, and very clean. The owner was very responsive and also provided a lot of great pointers on the area and what was close to the neighborhood. Perfect for our family of 5, would stay again or recommend to friends / family! So glad you enjoyed your stay - we would love to have you back! Lovely house and we had everything we needed. I would recommend this property. Everything was clean and very pleasant. The location was perfect. If we return to Wildwood Crest I would certainly stay there again.